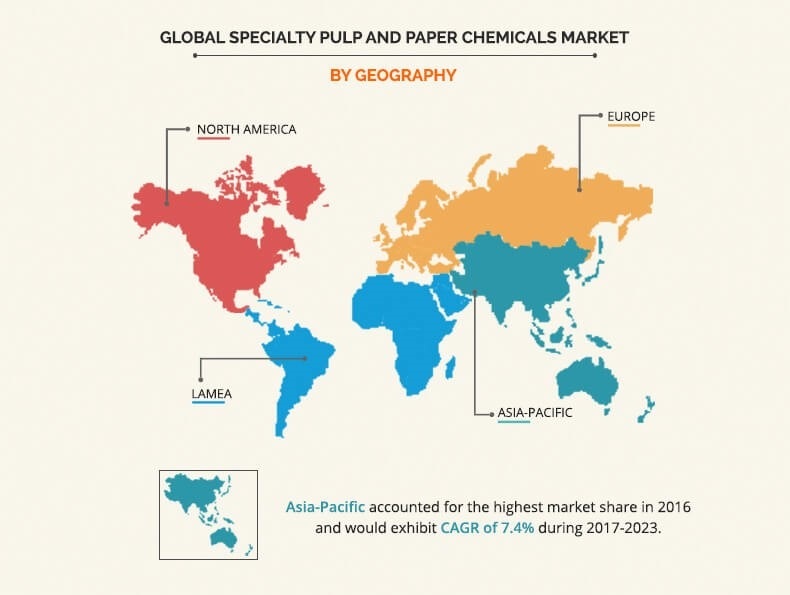 The Global Specialty Pulp and Paper Chemicals Market was valued at 15,568 million in 2016, and is projected to reach 22,829 million by 2023, registering a CAGR of 5.6% from 2017 to 2023. Specialty pulp and paper chemicals are generally defined as the chemicals and polymers with unique functions, which are used to enhance quality and performance of paper. Chemicals such as the bleaching & RCF chemicals, process chemicals, functional chemicals, coating chemicals, and pigments & filters are used as specialty chemicals to produce specialty paper. Moreover, these chemicals are the integral part of paper manufacturing process, which reduces the consumption of water and energy. The use of specialty papers such as tissue papers, diazo papers, laminations, magazines, envelopes, and others also augment the demand for specialty chemicals, which in turn drive the growth of the market. Increase in use of functional chemicals to enhance paper performance by adding special properties & features to optimize production, improve competitive advantage and introduce consumer benefits in everyday products fuel the market growth. Moreover, rise in consumption of recycled paper further supplements the market growth. 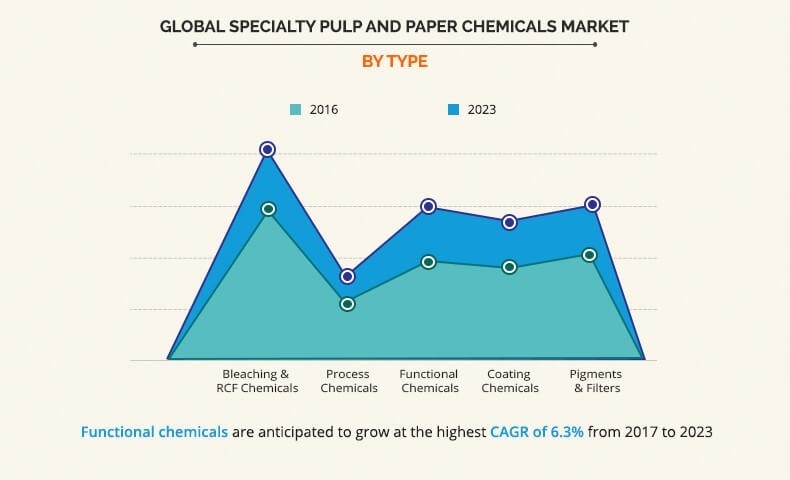 The key players operating in specialty pulp and paper chemical market include AkzoNobel N.V., Ashland Inc., Buckman Laboratories International, Inc., BASF SE, Buckman Laboratories International, Inc., Kemira Oyj, SNF Floerger, The Dow Chemical Company, Evonik Industries AG, Nalco Holding Company, and Shell Chemicals. In 2016, Asia-Pacific accounted for the largest market share in the global market and is anticipated to maintain this trend during the forecast period. Rise in per capita consumption of paper products, availability of raw materials, and surge in R&D activities for the development of the innovative products increase the demand for specialty paper in wide applications related to packaging, printing, and labeling, thus propelling the growth of the specialty pulp and paper chemicals. India and China are expected to exhibit significant growth on account of industrialization supplemented by low labor cost and rapid economic growth. In 2016, bleaching & RCF chemicals accounted for the highest market share in the global market, and is anticipated to maintain this trend during the forecast period. The objective of using bleaching & RCF chemicals is to dissolve or modify the brown-colored lignin that was not removed during pulping, while maintaining the integrity of the pulp fibers. 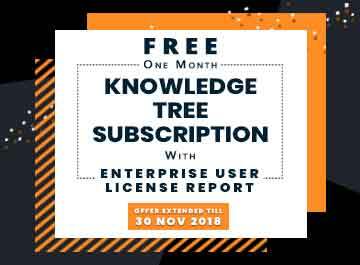 Increase in demand for high quality specialty papers leads to the rise in consumption of functional chemicals such as dry-strength additives, wet-strength resins, fluorescent whitening agents, sizing agents, and others. 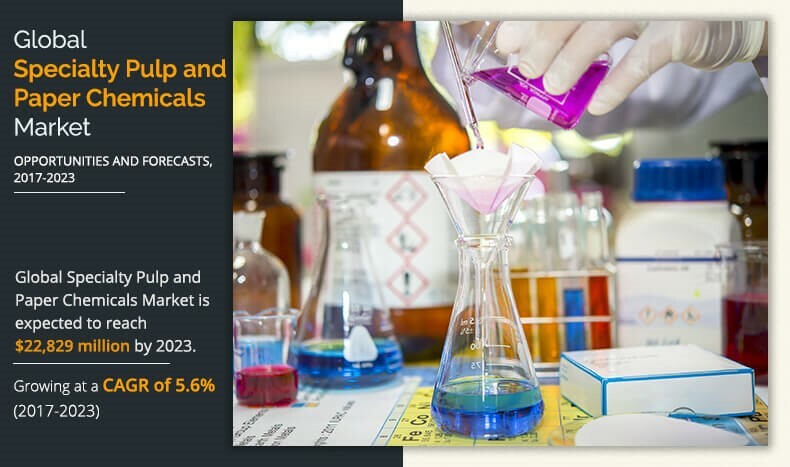 Functional chemical is anticipated to grow at the highest CAGR of 6.3% from 2017 to 2023. This report provides a quantitative analysis of the current trends, estimations, and dynamics of the global specialty pulp and paper chemical market from 2016 to 2023 to identify the prevailing market opportunities. In-depth analysis of the market segmentation helps determine the prevailing market opportunities. The major countries in each region are mapped according to individual market revenue. The market player positioning provides a clear understanding of the position of leading companies. 3.4.3.1. Use of specialty pulp and paper chemicals for energy conservation. 6.2. Ashland Global Holdings Inc.
6.4. Buckman Laboratories International, Inc. Specialty chemicals include bleaching & RCF chemicals, process chemicals, functional chemicals, coating chemicals, and pigments & filters. These chemicals are an integral part of paper manufacturing process, which reduces the consumption of water and energy. The growth in demand for specialty paper is anticipated to drive the specialty pulp and paper chemicals market. The consumption of specialty paper and specialty chemicals experiences an increase among various industries such as food, healthcare, constructions, automotive, and others to improve or attain profit, meet customer demands, and embrace technological change. This is expected to boost the growth of the specialty pulp and paper chemicals market. New products with better performance and quality are required to gain competitive edge, improve productivity, and control costs in operations. This in turn increases the demand for specialty pulp and paper chemicals in the paper manufacturing industry. Moreover, the increase in per capita consumption of paper products particularly in China, India, and other developing markets is expected to make way for a major growth opportunity for the specialty pulp and paper chemicals manufacturers. "Specialty Pulp and Paper Chemical Market"